Glevan Consulting has been successfully involved with many projects requiring the detection, diagnosis and mapping of Phytophthora cinnamomi, ranging in size from thousands of hectares of mining leases to small metropolitan reserves. These projects have been performed across a variety of vegetation types, land tenures and rainfall zones, providing the employees of Glevan Consulting with a wealth of experience in the variability of the disease expression. 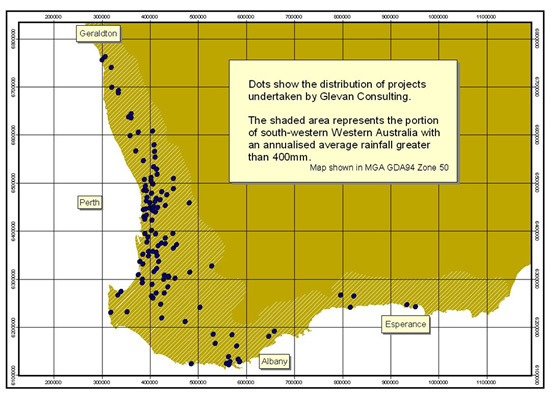 The following image shows the distribution of some of the projects completed.